A time for in the Church for carers and tiny tots, followed by refreshments and chat in the Church Hall. Middle Rasen Toddler Group . A group of parents and their young children meet every Friday morning during term time from 9:30 to 11:30am at Middle Rasen Church Hall. Just £2 per session. It's a chance to offer support and friendly advice to each other and an opportunity for the children to socialise with other children, play with new toys, do a craft activity and have a sing song. Juice & biscuits are provided for the children and parents have a welcomed mug of tea or coffee. There is a soft baby corner and breastfeeding mothers are made welcome. The Story of The Willow Pattern was a major part of Class 3's learning during their topic of China, and became a key part of the school calendar when the children of Year's 3 and 4 performed a musical production of A Garden in China. The play told the story of The Willow Pattern and all children took part in the two performances that took place for the whole school and also to parents, friends and relatives of the children. Class 3 produced all props, costumes and stage construction, and the performance was a resounding success. What a wonderful way to consolidate learning across the curriculum! Classes 1 and 2 enjoyed a visit to Woodside recently with learning focussing on habitats, different animal groups and habitats amidst plenty of careful minibeast and reptile handling. The whole school has celebrated World Book Day and has hosted their own Joke-a-thon to raise funds for Red Nose Day. Jan 19 .... The wonderful wooded area on the school field has continued to be part of the topic-based curriculum learning in Middle Rasen Primary School, and with the new addition of a fire pit, the children have experienced some truly magical moments. Reception children (Birch Class 1) tasted Gruffalo crumble around the fire while Years 3 and 4 children (Beech Class 3) have used the fire to create medieval medicinal remedies. Years 5 and 6 (Oak Class 4) enhanced their learning of The Highwayman with reading in the woods around the fire. KS1 (Classes 1 and 2) have performed The Landlord's Cat to two packed audiences, which has brought the Christmas spirit well and truly into school. Superb costumes, wonderful singing and some amazing dancing accompanied the impressive acting and narrating in the production. Happy New Year to you all from Middle Rasen School! December .... Middle Rasen Primary School Years 3 and 4 children (Beech Class 3) have not been perturbed with the slightly delayed opening of their new classroom and the walls are already being filled with lots of wonderful work. The children are very excited with the new building, particularly as they are self-contained; with toilets, cloakroom and wet area within the building as well as a large amount of new furniture and fittings. In addition to the new classroom, the school field has had a play pirate ship added during the October half term break, with children of all ages throughout the school enjoying playing and exploring. In contrast, fairy houses have been spotted in the woods, causing much excitement, awe and wonder (especially with Birch Class 1). The rest of the Autumn term plans will make for a very busy few weeks, with the annual whole school trip to the pantomime and KS1 Christmas production. November ....Middle Rasen has continued the amazingly busy start to the year with another two classes already having been on educational visits to enhance their learning. Class One visited Cleethorpes sandpit and boating lake as an end to their topic of Holidays and an introduction to their topic of Pirates. While eating their picnic lunch, they found a treasure map, which they followed and it led them to a treasure chest buried in the sand. Class Three have started their new topic Medieval England with a visit to Tattershall Castle. The children took sketches, made notes about the features of the castle and took photographs to use in work as well as taking part in some drama and role play. All of the children are working hard to fulfil the school's qualities, with lots of examples being seen for determination and pride in particular. October entry from Kerry .......Following a fantastic summer break, all the children and staff have returned to school refreshed and ready for another year at Middle Rasen. All staff members remain teaching in the same classes and the new starters in Foundation Stage have had a very positive start, and are quickly adapting to the new school routines and friendships. Class 4 (Oak) has already enhanced their learning for the topic of Space with a visit to The National Space Centre within the first week of school. Other visits are also planned for early in the term, which will be reported on in the next issue. The school is expanding with another classroom being added on the school field. Years 3 and 4 will be relocating and there is much excitement from the children about this. Although we had intended for the work to be finished by the time the term started, this has not been possible, but it is, however, planned that the grand opening will be imminent! Earlier ......Representatives of the Wilkinson Trust came to visit Middle Rasen Primary school to see the Promethean touch screen boards that they kindly bought for the school. The children were very keen to demonstrate how the boards work and gave lots of examples of how they are used in different lessons. Our School is very lucky to now have these high tech boards in all of the classrooms and are grateful for the grant from the Wilkinson trust which allowed us to buy two boards. Fundraising for a third was done by the Friends of Middle Rasen School. Thank you! Rainbows meet at the Village Hall, Wilkinson Drive. Our meeting times are 5pm - 6.15pm. I will have some places after the Easter holiday, so if anyone would like to apply they must be 5years old to start but can go on the waiting list at any age - I do have a 1 year old on already!! To apply you need to go onto www.girlguiding.org.uk register and then the rest is sorted out from Headquarters. Well what a busy term we had. We have welcomed some new rainbows, Isabella, Evie and Olivia, and we said goodbye to Peyton, Lila and Bethany, who have gone up to Brownies. We had a trip to see Madagascar, the musical at Grimsby which was very good! We have been getting used to the new national scheme and all the rainbows received their skill builder badge and also some activity badges. We had a very sticky pancake night with some very strange fillings! With Mothering Sunday coming, we have made a gift and card for our Mummies and to finish the term, we have Easter Eggs to make! We are all looking forward to the lighter evenings when we can get outside for more fun and games next term! Rainbows have been very busy since resuming in September. We have said hello to some new girls, Caitlin, Jessica, Layah and Amelia and goodbye to Angel, who has gone onto Brownies. We have completed a Rainbow roundabout badge, made scary bats for Halloween, learnt how to cross the road safely, can recognise road signs, dangers in the home and have played some of our favourite games. We also had a Fairy day, which was great fun. We made fairy gardens, key rings, bookmarks, wands, cakes, fairy doors with keys, fairy dust and lots more! The day started at 10am and finished at 6pm, very tired but happy fairies (and leaders) went home that night!! We have also taken part in the Remembrance Sunday parade in Market Rasen and are now enjoying our build up to Christmas and our end of term party. Well yet another half term has passed by with lots of busy rainbow meetings. We have made birth congratulation cards for the Duke and Duchess of Cambridge, weddings cards for the Duke and Duchess of Sussex, learnt about William Shakespeare and St George. We took part in a headquarters survey regarding the future of guiding, had a games night and to finish off a fantastic visit from Louise at Happy Hooves with some lovely small animals. We had Chinchillas, a ferrett, Pigmy hedgehogs, Tortoises, An African land snail and a beautiful barn owl who was called Squark and was only 5mnths. The rainbows asked questions and helped to walk and bathe some of the animals and hold the barn owl. I wonder what next half term will bring? Rainbows have had another full programme with lots of crafts, fun and games. We said goodbye to Katie and Aeronwen who are now having lots of fun in Brownies, and welcomed Angel and Imogen into Rainbows. The girls have completed a badge 'All About Me,' learnt about St Patrick and made some lovely cards and gifts for Mothering Sunday. To finish this term we decorated Easter bonnets and went home with lots of chocolate treats. While away the Brownies worked towards their Brownie Holiday, Cooks, Musician and Entertainer badges. Activities included: Hand chimes, cooking biscuits, designing and making costumes and programmes along with cooking their meals and looking after our Holiday Home. The Brownies then showed off their talents at our Talent Show on the Saturday evening. We've had a really busy year again this year and thanks to the glorious summer we've spent a lot of time outside. But as Christmas drew ever closer we enjoyed a lovely weekend at Moot Hall, Holton Le Moor. 17 of us descended on the Victorian building to enjoy a weekend of arts and crafts, great food, walking, singing and Christmas films. Joined by our own Elf On The Shelf, who got up to far more mischief than all the Guides put together, we all headed home on the Sunday afternoon ready for an early night! Thank you to all our Leaders who worked so hard to make it such a wonderful weekend. Over the year many people have supported us and we're always so grateful. We'd especially like to thank Middle Rasen Parish Church for their recent donation, which has helped towards the purchase of Christmas crafts and activities. As always, if any young girls between the ages of 10 and 14 would like to join us in the New Year, we'd love to meet you. We meet at Middle Rasen Village Hall on a Monday evening from 6.30 pm until 8.15 pm. We hope everyone had a very Merry Christmas and wish everyon a Happy New Year! Recently, to celebrate the Lunar New Year; the girls learnt the Chinese alphabet and learnt how to spell their names by writing them on bookmarks, which were decorated beautifully. They also tried authentic Chinese food to help celebrate the New Year! Furthermore, the Guides, in preparation for Mother's Day, practiced their sewing skills, going towards the traditions badge and made their mums some wonderful hanging ornaments, which they will love. They also decorated some cards that looked spectacular! On the 8th January 2018 the Guides learnt about the importance of different communication around the world. We did this by learning about Braille, Morse code, sign language and semaphore. The girls enjoyed creating messages in braille about world peace. Some of the messages they wrote were; 'Let there be no conflict in the world 1 , and 'Make the world a no-war zone'. 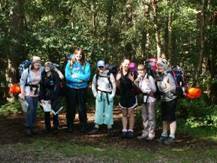 In the summer 2017, the 2nd Middle Rasen Guides attended the week long International Guiding and Scouting residential Jamboree,. One of our more senior guides, Floss, was given the opportunity to present the opening and closing ceremony, as the 'Face of Poacher'. This involved introducing over 4000 participants and 5000 leaders into the proceeding week. After the closing ceremony, Floss attended a meet and greet session with the dance troupe, DIVERSITY, which served as an amazing opportunity for Floss. Everyone at 2nd Middle Rasen Guides is proud of the fantastic job that Floss undertook with confidence and grace. The girls at Middle Rasen Rangers have loads of fun choosing and arranging their own activities within the Guiding program. In the last twelve months we have had girls training and completing their Bronze Duke of Edinburgh award (see picture taken near Legsby), some have now moved on to start work on the prestigious gold award whilst we have more now training for their Bronze. We are now fundraising and applying for grants for our own equipment. They have taken part in a County camp for guiding members their age (14 – 25, call the Senior Section), where they had the opportunity to take part in kayaking, air rifle shooting, archery and Japanese braiding. They have organised an evening's ice skating, a fund raising fashion show, international food tasting and helped run events for the 2 nd Middle Rasen Guides. They have also been to Sheffield arena to see the popular group JLS. In January they organised a weekend away and one of our girls achieved her Senior Section Holiday Permit by coordinating the arrangements and program for the weekend. Many of the girls are also training as Young Leaders with Rainbow, Brownie and Guide units in the Market / Middle Rasen area and we have three qualified Young Guiders in more training. We meet once a fortnight on a Monday and are always open to new members, you can contact us on 07961 970579. Girl Guiding UK's Centenary Celebrations will conclude with Vision, the grand finale, at 20.10 20/10/2010 (8.10pm on 20th October, 2010). On that day members will reflect on the Centenary year and make pledges about their vision for the future-in guiding and beyond. Middle Rasen Rainbows, Brownies, Guides, Rangers, Y'L's and Guiders will come together with members of Market Rasen Division and reflect on the past year, renew their commitment to guiding and look to the future - creating a vision of what they want in the years to come and pledging to make it happen. Members can tune in and share the moment as a TV broadcast, focusing on girls' pledges for the future and ending with the promise, will be shown on the Community Channel (Sky 539, Freeview 87) from 7.55pm and ending at 8.15pm. 100 years ago, a small group of courageous girls stepped forward at the 1909 Boy Scouts Rally in Crystal Palace Park and asked its Founder, Robert Baden-Powell for “something for the girls”. The result was the Girl Guides. Local Rainbows, Brownies, Guides, Senior Section and Guiders from our local units joined up with members from all over the County, past and present, to celebrate this event in a very modern way by taking a trip to Pleasure Island , Cleethorpes. Everyone had a great day trying out all the rides and watching the shows. Then in the afternoon over 2300 joined together to renew their promise. Any girls aged 10 years and over are welcome to come along to guides to find out more of what is going on. For more info contact Katie Wright (843658). It was an evening of celebrations at the last meeting of the year for Middle Rasen Guides. Not only were they celebrating Christmas, but also twenty years of Guides in Middle Rasen. Among the invited guests were Sheila Lamming who started the Guide unit, Division Commissioner Mrs Jan Stimpson, and two former guides - Alice and Becky. Both were presented with their Baden Powell certificate, which they had worked for at Guides. Everyone sang Happy Birthday as Alice and Becky cut the birthday cake. Then Guides and visitors enjoyed the party food, which the girls had provided. Party games were played, and the most original party hat was judged. The evening concluded with the enrolment of two new Guides, and a sad good-bye was said to Guider Katie. However, Linda and the Guides are looking forward to two new Guiders joining them in the New Year. when an exciting programme of meetings will start on Monday 11th January at 6.30pm. 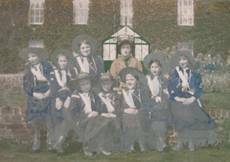 As Guiding looks forward to celebrating its Centenary next month it is interesting to recall that one of the first ever Patrols was formed at East Barkwith in April 1912. Miss Nora Denny who was the daughter of the local doctor, had been involved with guiding from 1910 and she started with seven girls. 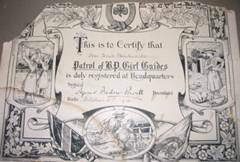 They were duly registered at headquarters in October 1912 as the East Barkwith patrol of Baden Powell Girl Guides with the certificate signed by Agnes Baden- Powell and the first six girls made their promise on November 1 st 1912. A jumble sale was held to raise some funds and made £6.0.6 and the shopping list for the first camp held at Mablethorpe includes coal 1s 2d (5p), paraffin 9d, candles4d and beef 4s 2d (40p). Each guide contributed 3s 6d for the week, Miss Pike and ‘Mother' each gave 5s (25p) and Dr Denny paid the rent for the cottage they stayed in £1 10s (£1.50). The shared transport for the first stage of the journey to Louth to catch the train involved taking turns to ride with Mrs Denny in her tub trap and Mrs Duckering with her pony and dog cart or on the two bicycles, returning the same way. The Rev'd Ferry gave them the use of a room at the Rectory for meetings and Mrs Smithson gave a big hearth rug and lent a table and tablecloth. They also had a lamp, camp stools and a fireguard and the girls, worked for dairy and sick nurse badges and took part in a competition with Horncastle guides in first aid, signalling and cooking. A committee meeting was held at Barkwith House in March 1914 and the first report recorded there were then ten guides and they had sent parcels of garments and dressed dolls to Dr Barnardo's Homes at Christmas 1912 and 1913. Letters were also sent to a little invalid girl in Newcastle each week with a doll at Christmas and a parcel of toys when at camp all subscribed by them. No camp was held in 1915 due to the war and it was difficult keeping the Company in existence as there was no one to help them when Miss Denny was absent nursing. In November 1915 Dorothy Barwick gained the War Service Badge. Miss Denny went to live in Vancouver later where she set up a private school with her friend but she retained her interest in guiding and took the idea of white haversacks to her guides in Canada. The Red Cross ordered them to remove the red crosses during the war. Miss Denny also kept in touch with friends in East Barkwith until her sight failed. The Barkwith Group of parishes was formed in 1960 and cub, scout, brownie and guide units were again set up by the Rev Tony Simpson and helpers with the Barkwith Guide Unit registered in June 1967. It eventually moved to Wragby when most of the girls were travelling from the town and when new leaders wanted Wragby to have a unit of its own, the name was changed and the 1 st Barkwith title was adopted by a new unit formed at Donington on Bain. Sadly it did not survive long as there were not enough girls or leaders to retain interest and to keep the old patrol going. The FISDAC Academy has moved out of area. Normally the club ran every Sunday during term time at Middle Rasen Village Hall with weekly Street Dance, Cheerleading or Multi-Sports classes. Jenny and Ian on 07875246427 have moved out of area but may be contacted by email info@fisdac.co.uk , or just visit their website "www.fisdac.co.uk" for an update.. It is no so long since there was an active Karate club in the village. Instructors are CRB checked as part of the worldwide group GO-KAN-RYU Karate. The Middle Rasen club was run from the Village Hall with a regional instructor ‘Sensei' James Davie, who co-ordinates all clubs in the area. If you are interested in taking up karate or joining a group, then please contact Sensei' James Davie first on 07659124950. If appropriate he will then arrange for someone to visit you and explain where the local club is and outline the charges. Currently there is a one off Lifetime registration fee of £49 which covers things like insurance. After that each session has a charge. There are concessions if more than one family member joins. A karate gi (suit) is around £30 to buy.